If he wins the race to regain his Wisconsin seat, he'll join Bernie Sanders and Elizabeth Warren in their fight for economic justice. Everyone else is talking about Donald Trump and the mess that has been made of American politics, about deepening divisions and the ugliness that the 2016 election has exposed. Not Russ Feingold. He’s talking about making it easier to access the Internet. But he’s not doing so in the way that politicians usually do—adding another vague promise to a laundry list of proposals that they hope will touch just enough hot buttons to get them elected. Feingold is going into detail about a digital disconnect that puts some Americans on an information superhighway and others on the equivalent of a digital dirt road. When high-speed Internet isn’t universally available, says the former senator from Wisconsin, high-school students have to sit at night in parking lots outside small-town libraries and schools, trying to get a decent enough signal to finish their term papers. Small businesses can’t compete with multinational corporations because the digital playing field is uneven. And the people who are always left behind—in the inner cities and at the end of country roads—find themselves left out of the future they were promised. Then Feingold does something that few candidates do these days: He lays out a vision—one that extends back to Franklin Roosevelt’s rural-electrification program and Dwight Eisenhower’s interstate-highway system—to guarantee access for all Americans to high-quality, high-speed Internet as part of a bold push to address inequality. Let municipalities, co-ops, and nonprofits compete with the telecommunications giants, and let government provide regulatory, technical, and financial support to close the digital divide. “Get it done!” Feingold declares at campaign stops across Wisconsin as he campaigns for the Senate once more. “It’s unacceptable that everyone doesn’t have the same access to the Internet. This should be like a utility, like electricity or telephone, where it’s guaranteed to everyone. That’s the change in attitude that has to happen.” When he finishes his talk in Fond du Lac, the union members and small-business owners and students and retirees are on their feet. They’re cheering. And smiling. If there’s an antidote to the bitter, broken politics of 2016, it’s a Russ Feingold rally. The former senator, who has maintained a steady lead in the polls as he seeks to regain the seat he lost in 2010, refuses to get bogged down in the petty politics of the moment and generally steers clear of personalities. Feingold is thinking about the future. The former legislator, who is perhaps best known for his part in enacting the McCain-Feingold Bipartisan Campaign Reform Act of 2002, argues that Democrats and Republicans, liberals and conservatives, are still searching for common ground outside Washington. Feingold peppers his remarks with references to Wisconsin real-estate agents who tell him that reducing student-loan debt will free young people to buy homes; to business owners who say the “free trade” agreements of the past have failed and who share his opposition to the Trans-Pacific Partnership; to self-described conservatives who support an increase in the minimum wage. Officially, Feingold is running against Republican incumbent Ron Johnson, a hectoring Ayn Rand disciple whose stump speeches blend Tea Party talking points with the fury of right-wing talk radio, and who jokes about the prospect of campaigning with GOP presidential nominee Trump as “the Ronald and the Donald.” In fact, Feingold is running against the cruel-and-unusual politics of the past half-decade. And he’s arguing that, as a candidate who combines decades of legislative know-how with the recent experience of a citizen frustrated by a dysfunctional Washington, he is uniquely prepared to advance fresh proposals, build coalitions, and make the Senate work. To get it back, of course, to change the political dynamic that began with his defeat in a 2010 election cycle that saw Republicans gain six Senate seats, 63 House seats, and six governorships—including that of his native Wisconsin—requires more than just one victory. 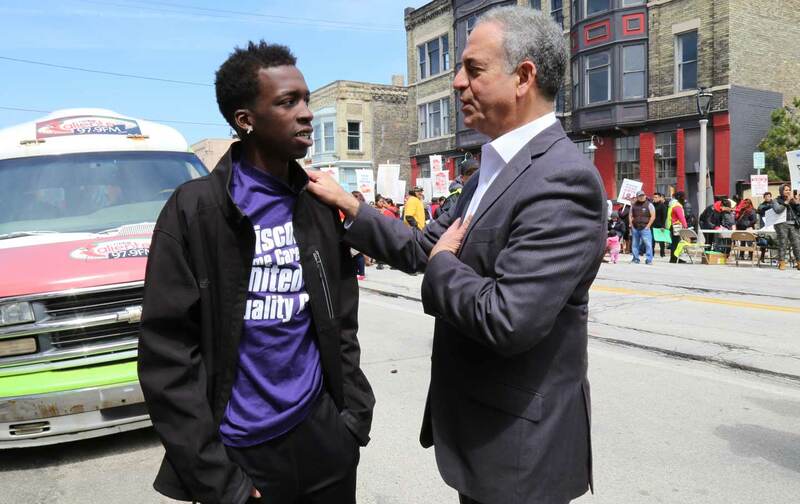 Feingold sees his comeback bid as part of something bigger for his state and his country. Feingold talks about this all the time in the campaign he’s been waging for more than a year—one that has taken him to every corner of the state he served as a legislator in Madison for a decade and then represented in Washington for 18 years. Feingold says he wants a Wisconsin win to be part of a wave that Democrats need to take at least five seats and regain clear control of the Senate. And he wants to win big, to provide a political pivot for his once proudly progressive state, which has in recent years elevated Republicans Paul Ryan, Scott Walker, and Reince Priebus to the national stage. Feingold speaks at every stop about local Democratic candidates, and in a state where the GOP has had nearly complete control for five years, the down-ballot contenders embrace him as more than just another Democrat. Public and private polls generally have him pulling higher numbers than Hillary Clinton, and Wisconsin Democrats tend to see Feingold as the candidate who will lead their party out of the political wilderness. But Feingold’s determination to enact campaign-finance and ethics reforms—which he succeeded in advancing in the Senate, to the frustration of both Republicans and Democrats—was never about reform for reform’s sake. Long before Massachusetts elected Elizabeth Warren to the Senate, long before Vermont sent Bernie San­ders to the upper chamber, Feingold was warning about the threats posed by multinational corporations to our elections, our economy, our privacy, and democracy itself. He voted against the North American Free Trade Agreement, against the 1994 update of the General Agreement on Tariffs and Trade, which steered the United States into the World Trade Organization, against “permanent normal trade relations” with China—warning every step of the way that the corporate-friendly trade deals would lead to “a race to the bottom” that would harm workers in the United States and abroad, and that structures in those agreements intended to resolve trade disputes would in fact undermine the ability of citizens to protect their environment, communities, and human rights. Feingold was one of a handful of Democratic senators who opposed the 1999 repeal of the Glass-Steagall Act protections against banking abuses. With Bernie San­ders, he opposed the 2008 legislation that bailed out Wall Street but failed Main Street and homeowners. Feingold was the lone Senate Democrat to oppose the watered-down 2010 Dodd-Frank reforms, warning that they didn’t address the fundamental flaws of a system that allows “too big to fail” banks to call the shots. Feingold opposed bad trade agreements, deregulation of Wall Street, the Patriot Act, and the Iraq War. It’s a laughable charge. The fact is that Feingold passed up chances to run in the 2012 gubernatorial-recall election and in that fall’s race for an open Wisconsin Senate seat, which was ultimately won by Democrat Tammy Baldwin. And he has resisted references to his past service in this year’s race. His campaign signs feature an outline of the state of Wisconsin and one word: “Russ.” And his message is very much of the moment. Feingold hails Bernie Sanders for bringing economic issues to the forefront of the 2016 election cycle—and Sanders has returned the favor by endorsing Feingold’s candidacy and raising funds for the Wisconsinite. Even before the Sanders presidential campaign took off last year, Feingold began his own Senate bid by declaring that economic inequality, wage stagnation, and the sense that the system is rigged against working people would be the focus of his run. That focus appeals to Senator Elizabeth Warren, who has already been to Wisconsin to campaign for Feingold, with whom she’s been aligned for decades on fights over banking regulation and bankruptcy protections. Warren hails him as “an absolute hero on the issues that matter to working families, to middle-class families in America,” and she talks about how excited she is at the prospect of working with Feingold in a Senate that is controlled by Democrats and more inclined toward progressivism. Feingold is similarly excited. He says he wants to be part of a new wave of senators elected this fall “who can work with Elizabeth and Bernie Sanders and [Ohio Senator] Sherrod Brown, [Oregon Senator] Jeff Merkley, and others. I think we have a chance to have one of the best combinations of progressive senators since…the progressive era.” That combination, whether it’s a formal Senate progressive caucus or an informal arrangement, could ensure that congressional Democrats and a new Democratic president both keep campaign promises and begin to aggressively champion the economic-justice agenda that Warren has framed so effectively, that Sanders has popularized, and that Feingold wants to expand with structural initiatives like his broadband proposal. His enthusiasm is infectious not just because of what he’s against, but because of what he’s for. Of course he wants to beat Trump and a Republican senator who backs Trump. But Russ Feingold gets most excited when he’s talking about what a new progressive era could mean for working Americans: wage hikes, affordable college, secure retirement, fair trade—and, yes, faster, better Internet for those folks living at the end of that country road.